The Brook House was built in 1922 and restored to its present country charm. 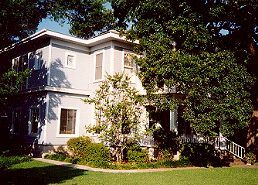 The bed and breakfast is located seven blocks from the University of Texas with easy access to local restaurants and live music. Choose one of six guest rooms, each of which has a private bath, cable television and a telephone. The main house features three lovely bedrooms. In the tree shaded backyard, you'll find a private cottage and a carriage house. A full breakfast is served daily, outside on the veranda, weather permitting. On cool mornings, a fire in the dining room fireplace enhances the warm and friendly atmosphere. Smoking only on the outside porches and grounds. Rates: weekdays from $70 and on the weekend from $75 to $99, based on double occupancy.